Our Conveyor Roller Table “ROLLERCUT” is manufactured from a metallic frame, which supports some sheet tanks provided with steel rollers that can bear approximately 300 Kg/m of load. This Roller Conveyor is used in various industries and its height is adjustable (910-1015 mm) to match diverse needs. 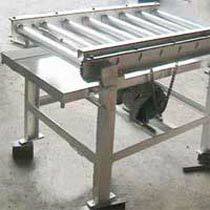 We are considered as one of the leading Manufacturers, Suppliers and Exporters of Conveyor Roller Table. We provide wide range of Roller Tables manufactured using high grade raw materials to ensure resistant to corrosion and long hassle-free life. The range of Conveyor Roller Table, we offer, is available in numerous sizes and shapes. The control panel is in the front of the Roller Conveyor. The electronic panel can be customized. It allows an easy programming 98 storable programs, 14 different storable cutting lengths for each program, cut counting, semiautomatic shift to the height of the following series and possible manual operation.